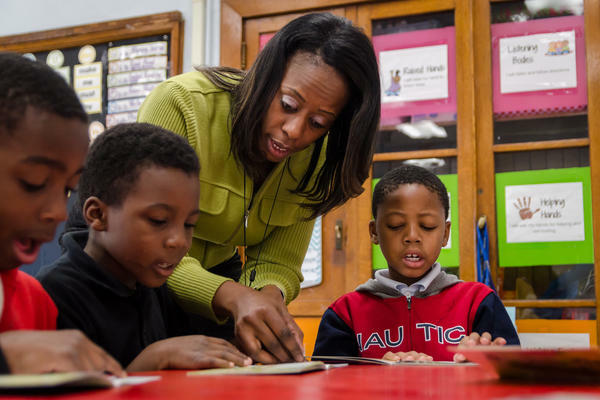 Iris Jackson works with first-graders at Patrick Henry Downtown Academy in St. Louis on a reading comprehension assignment in November. Jackson is a member of a new teacher residency program that's trying to reduce teacher turnover. Missouri’s education oversight board wants to better understand why one in seven public-school teachers in the state quit every school year. The State Board of Education discussed teacher pay and retention at its January meeting Tuesday. It was the first gathering for education commissioner Margie Vandeven since being removed from the post by then-Gov. Eric Greitens in December 2017 and then hired back last year. Missouri has the second-lowest average starting teacher salary in the country at $31,842, beating only Montana, according to the National Education Association teachers’ union. The U.S. Department of Education’s National Center for Education Statistics reports average salary for all teachers in the state is $48,293. Pay is lowest in the most rural portions of the state and urban districts. Low pay is one factor state school board members say contributes to Missouri’s poor retention rates. Across the U.S., about 8 percent of teachers leave the field every year. Fourteen percent of teachers in Missouri quit. “I don’t think there’s any question that the money part of this is an issue. We recognize that, but it’s certainly not the only issue out there,” said Charlie Shields, the board’s president. Leadership quality, mostly meaning principals, and overall school climate are other key factors in why teachers leave. “I think there are people who leave teaching that use salary as the excuse, but the real reason for leaving falls under one of those other two: leadership or climate,” said board member Donald Claycomb. Neither the board nor state Department of Elementary and Secondary Education can directly set teacher pay. The state can do more through policy and training to improve school climate and principal quality. The state education department does not presently collect data on why teachers leave the profession. While school districts may conduct exit surveys of teachers, the answers aren’t submitted to the state. Board members said they want to start doing that. Shortages of teachers are most prevalent in math and special education. “If you kept a much higher percentage of the teachers entering the profession in the first five years, it would dramatically affect those shortage areas,” Shields said. Turnover would have to be reduced to 4 or 5 percent in order to do that, according to Paul Katnik, an assistant education commissioner. The work to update how state education officials measure school districts’ ability to educate their students is shifting into a new gear. Updating the Missouri School Improvement Plan was put on hold last year because of Vandeven’s removal and lack of a quorum for the state school board for the first half of 2018. Because of that, Deputy Education Commissioner Chris Neale told the board the overhaul of the program likely won’t be in full effect until the 2020 or 2021 school years. “We have been through such an odd period of time that we have to say everything is starting over now,” he said. The first update to school accountability in more than five years will more heavily factor in school climate and student behavior, as well as college readiness. The rubric is crucial to determining state accreditation. The board will have to collect public comments on changes put forward and will have a few pilot districts before widespread implementation in two to three years. Correction: A previous version of this story had the wrong first name of a State Board of Education member. Mr. Claycomb's first name is Donald.